As we wind up the school year we are going to use these last two weeks to talk about Science works. This week is all about the Atom Board. I visited with our Upper Elementary class and two students put together the atom for Calcium. 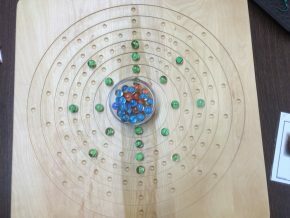 The atom board is based on the Bohr model. The Bohr model depicts the atom as a small, positively charged nucleus surrounded by electrons that travel in circular orbits around the nucleus, this is similar in structure to the solar system, but with electrostatic forces providing attraction, rather than gravity. Because of its simplicity, and its correct results for systems, the Bohr model is used to introduce students to quantum mechanics. This work has a wonderful eye catching design that features scalloped “energy circles” to symbolize the placement of electrons around the nucleus. 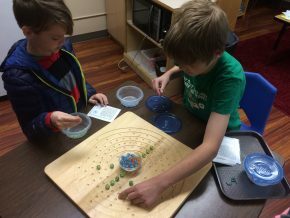 We use different colored marbles to represent the atomic particles; protons, neutrons and electrons. The center is a carved circle to represent the nucleus where students place a small dish which is then filled with the neutrons and protons. The atom board helps students learn hands on and visually see the structure of each atom they put together. They also have cards for Hydrogen, Sodium, Lithium, Magnesium, Chromium, Titanium and Potassium. Along with the atom board are a set of element cards that the student reads and then sets up the board to match the card. Each card shows a picture of the element, the name, and the chemical symbol. 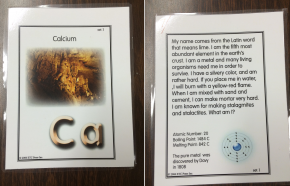 There is another set of cards with a description of an element and students have to correctly match them to the matching picture. The study of atoms is a rich content area, providing a solid basis for understanding everything from the fundamental building blocks of nature to the basis of modern technology. The structure of atoms is both beautiful and useful and provides a good context for teaching scientific reasoning skills. Next week we are going to check in with our Lower Elementary and learn all about Botany!